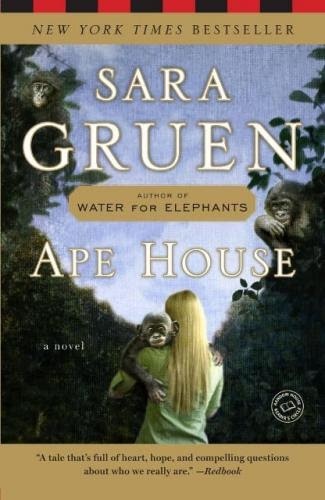 In what could very well have been a financial misstep, when browsing at Books-a-Million with my very awesome friend Katie (whose anecdotal, hilarious blog you can find here), I decided to purchase Sara Gruen’s next book after Water for Elephants, Ape House. I have no interest in people who study monkeys. Well. Aside from Jane Goodall and Dian Fossey. So maybe I do have an interest in people who study monkeys. But it’s not something I would seek out information on like Liz Lemon. Only maybe not, because I’m one of those lazy people who doesn’t believe writing can be taught except it totally can and maybe if I went to a writing class once in my life I wouldn’t have huge sentences with almost no helpful commas and other grammatically incorrect things I’ve chosen not to care about. But for realsies, unless Water for Elephants does some big hideous turnaround and everything goes down the toilet, writing-wise, I love it like it’s a problem. The only thing I’m worried about is whenever the elephant shows up, because for right now, I have no interest in elephants. Like, less so than in apes. But I trust that I will continue to love the main character Jacob, and ignore the fact that though Marlena is platinum blonde in the movie, the book has her hair as ‘just dark enough to disqualify as blonde.’ A small matter, but one which is currently annoying me since the poster for the movie is so very, very shiny, which I enjoy. I demand that the book be changed so that Marlena has shiny blonde hair. So let it be written, so let it be done. Funnily enough, I just bought this book on audio last weekend for a road trip and now I'm about halfway through it. The reader, sadly, isn't very good, so it's hard for me judge just how good or bad the novel is. You've made me want to read it, hair matters aside, and I don't really care for elephants. @As the Crowe Flies and Reads I bought is based on the first two pages. Oops. When I get excited about things/authors, I tend to just jump in, although I HAVE been burned that way before. @chambanachik I'm like a third through it now and I still really like it. The trailer for the movie (which I had not seen until yesterday, but the shiny poster) made me like it slightly less, because it doesn't look that great, but I really like the writing. It isn't gorgeous prose or anything, but it still makes you want to keep reading. This will be a completely useless comment, but I honestly just had the need to express my enormous appreciation for your blog. L-o-v-e. You may now carry on. @waterfly89 That is obviously the best comment ever.